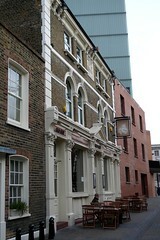 An attractive pub with modern decor, attached to a hotel, in Hackney. The main entrance is around the back of Mare Street, but it can also be entered from Mare Street through a tiled tunnel photo. It's been refurbished as something of a gastropub. Half the space (the side of the bar nearest the Mare Street entrance) is set up for service, tables laid with neat white napkins and cutlery, flowers and even candelabras (perhaps for display, or perhaps used in the evenings). There are five four-person tables, with a couple more up on a raised area at the side, and then a few other two-person tables. The front of the pub has several large couches with plenty of space, as well as a few high tables and stools. There are also tables out in the street by the entrance which are popular in the summer (this is on Sylvester Path -- more of an alleyway, really, as no cars travel along it). At the bar there are four handpulls for real ale, with London Pride, Landlord (£2.80/pint), Doom Bar and Deuchars IPA available in May 2009. They also have a range of draught lagers and some cider, with a few premium options available, and some bottled beers. There's a wine and cocktail list besides. The food menu is filled with interesting options, arranged into categories by meat (as well as a vegetarian section, labelled "land") photo of menu in May 2009, and a chalkboard carries daily specials. They also have a 'tapas' menu available. On a Sunday visit in May 2009, Ewan went for the nut roast option on the chalkboard (£9.50), which was very attractively presented, with a yorkshire pudding and the usual trimmings, served with a large chunk of nut roast, bursting with mushroomy and nutty flavours and which appeared to be made in-house (or else of a high quality) photo. Jo's goat's cheese tart starter (£5) was also prettily laid out and not too insubstantial. Desserts were also of a high quality photo of dessert menu in May 2009. The strawberries with balsamic dressing and pepper cream (£5) numbered only five, perhaps a little mean, though the pepper cream was extremely tasty, just the right balance of sweetness tempered by the pepper flavour photo. Ewan's pear and apple crumble with cinnamon ice-cream (also £5) was presented in a ceramic bowl with the dollop of ice cream on top photo. Last visited by Ewan and Jo, 24 May 2009. Last edited 2013-05-10 07:41:30 (version 14; diff). List all versions. Page last edited 2013-05-10 07:41:30 (version 14).